Christopher Bonanos is city editor at New York magazine, where he covers arts and culture and urban affairs. He is the author of Instant: The Story of Polaroid. 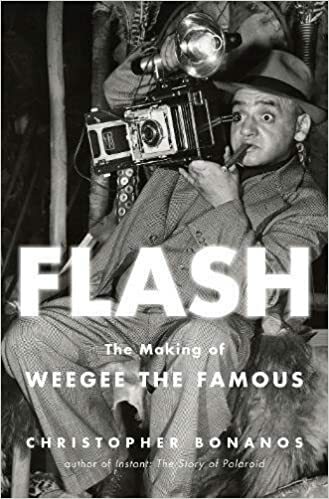 He talks to us about his new book, Flash: The Making of Weegee the Famous. Peter Manseau, author of the book The Apparitionists talks to us about the history of William Mumler, the founder of so-called spirit photography and the manipulation of photographs during the American Civil War. Manseau’s book is sprinkled with the showmanship of P.T. Barnum, and ends with Mumler’s most famous client (you’ll have to read the book). This Ep. continues to look a the #MeToo movement in photojournalism with Vox’s Kainaz Amaria. Her piece can be read here. As Vox Visuals Editor, Kainaz runs an interdisciplinary team specializing in graphics, interactives, photography, data and design. Previously, she was an editor on NPR’s Visual Team. Before all the desk jobs, she was a freelance photojournalist based in Mumbai, India. Her clients included The New York Times, Vogue India, and Reuters. Prior to that, she worked for the St. Petersburg Times in Florida. In 2010, she was a Fulbright Scholar and completed a short film on the Parsi Zoroastrian community in Mumbai. Her images and multimedia collaborations have been recognized by contests including CPOY, Women in Photojournalism, Atlanta Photojournalism Conference, the National Press Photographers’ Contest and the South Asian Journalist Association. She was named a Chips Quinn Scholar in 2007 and was a graduate teaching assistant at Ohio University. Kainaz joined the multimedia team at National Public Radio (NPR) in December 2011, and is currently based in Washington, D.C. This week we talk with prolific documentary photographer Daniella Zalcman about her insight into colonialism in the United States, as well as her role as founder of Women Photograph, a project elevating the visions of women and non-binary photographers world wide. Daniella Zalcman is a documentary photographer based in London and New York, whos work focuses on the legacies of colonization, from the rise of homophobia in East Africa to the forced assimilation education of indigenous children in North America. She has received the Pulitzer Center on Crisis Reporting grant, is a fellow with the International Women’s Media Foundation, and the founder of Women Photograph. We’re here with Elizabeth Renstrom, a photographer and photo editor of VICE magazine, talking about how to best pitch your work to editors, the changing landscape of photography online, and the insights that come with photo editing on such a large-scale platform.